Lose Weight With Detox - if you are losing fat permanently you are detoxing. Can you lose weight with detox? Yes. The only way you are going to permanently lose weight is by cleansing your body of toxins. This is often an uncomfortable process and sometimes it makes people sick. Stay with it because good things are happening. Many people do not realize that when they are fat those fat cells are storing toxins that adversely affect their health. The only way to lose fat permanently is to eliminate the worst foods and change your lifestyle. This will naturally include a detox that allows you to release fat and helps your body transport the toxins out of your system. You can make this process much more efficient and lose weight faster when you add this drink to your daily routine. The cucumber will counteract the toxins, supports your digestion and cools inflammatory conditions. Celery also improves digestion and is soothing for the liver which is working hard to process the toxins. When combined with the lemon juice it is very helpful to reduce acidity of the blood and to control your appetite. It's a good remedy for type 2 diabetes (along with exercise and eating all low glycemic foods.) The apple helps your body remove cholesterol and toxic metals. 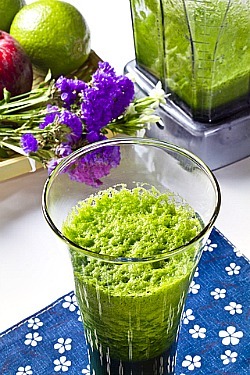 If you are using a Vitamix blender you will need to add a cup of filtered water and then blend well. You need to drink 1 glass twice a day. This recipe will give you 2 glasses of juice. Sometimes it seems quite difficult to get your body to release fat. Or you will lose a few pounds when you change your eating habits but then you get stuck on a plateau. It's possible that your body is holding onto the fat to protect you from the toxins and your metabolism may have slowed down considerably because of this. You can break through this with the help of the detox diet drink and eating mostly the cleansing foods and a small amount of animal protein. This is when you need to get very serious about this transition to healthier foods and be quite aggressive about the nutrient density of what you are eating. Eat mostly the cleansing foods: vegetables, fruit, legumes (beans) and whole grains like quinoa, brown rice, barley. Drink the detox diet drink 1 - 2 x daily. Drink 6 -8 glasses filtered water a day. Eat your main meal at lunch time and just a snack at night with your detox drink. Transitioning to a healthier diet may mean quite a bit of discomfort. You may get quite sick before you get better. If you had symptoms before you started a cleanse they will get worse. This is a GOOD sign! Stay with clean eating and regular detoxing with juicing and this will pass. There is a safe way to lose weight with detox and then there is the way that just leads to the cycle of putting the pounds back on quickly when you're done with the detox. Do NOT starve yourself or take a bunch of supplements designed to make you eliminate. You cannot end the detox with going back to your old way of eating. DO drink the detox diet drink and eat lots of citrus fruit like oranges and grapefruit. Grapefruit will minimize your appetite. These foods help your body to be less acidic and more alkaline and support the detox. In the morning have oatmeal or quinoa with unsweetened coconut, almond or soy milk. Have soup or salad for lunch. Eat lots of the cleansing foods including the vegetables and fruits with bright colors which means they are high in antioxidants, broccoli, berries, oranges, grapefruit, salads with dark leafy greens and sprouts, cabbage, kale, spinach, carrots, squash, and apples. The fiber in the produce and in the whole grains and beans will help you to cleanse. Do not skip meals. Eat citrus fruit and walnuts with a glass of unsweetened coconut or almond milk if you are hungry between meals. You have to detox the toxins that are in your fat cells by eating the proper foods and eliminating the ones that are making you fat and ill. Avoid sugar, white breads, white rice, pastries, white potatoes, fried foods and processed foods. Give yourself at least 2 weeks in the detox mode to jump start your transition to healthier eating. Once your sugar cravings have gone away and your body starts releasing fat you can go the traditional Mediterranean diet. However, you will need to regularly juice to flood your body with nutrients and continue to eat plenty of the cleansing foods and you will always be slender, healthy and full of energy! Return from Lose Weight With Detox to 10 Success Steps. Return from Lose Weight With Detox to Lifetime Fat Loss home page.